Joe lost his Kata final to a European champion, nothing wrong with that… Paul had a tough first round draw, losing to the category champion and no repercharge. Harvey lost in the third round to one of the category finalists, just missing out on a medal place. Lewis met Wadokai England team mate Rebecca Boakes (Sakura Karate Academy) in the semi’s before going on to secure Gold. 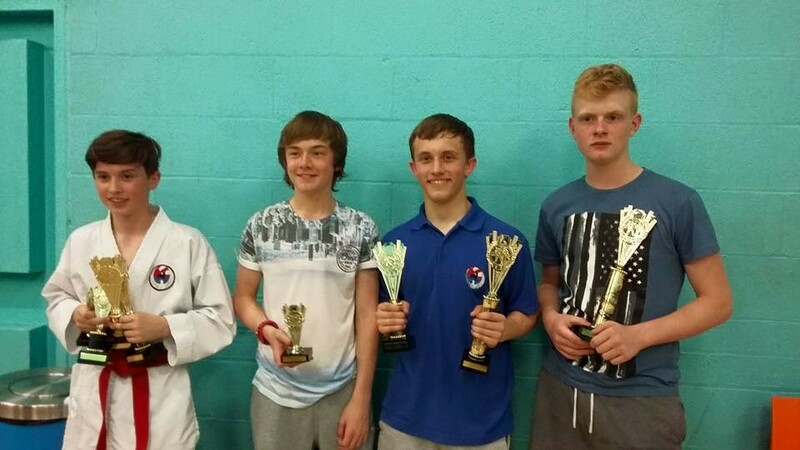 Joe lost in the Kumite semi’s against the same lad who beat him in the Kata final, score was tied 4-4, but Joe lost out at Hantai (judges decision), but he must have impressed, because he was asked to join his fight team later on in the day – where they won Team Gold! Harvey unfortunately didn’t get through the rounds due to Hantai going against him. Paul didn’t drop any points on the way to his Kumite final, which he took Gold in. Thanks to Graham for looking after the athletes and Rachel for the real-time updates whilst Amy and I were at our friends engagement party.